The polyphagous shothole borers (Euwallacea sp.) that spread fungal diseases (Fusarium sp. and possibly Graphium sp.) to susceptible trees in Los Angeles County have now been found in mid and northern Orange County and western San Bernardino County. Sick and dying trees are being cut down and shredded or chipped. A lot of different species of trees are affected, including avocado, box, elder, castor bean, coast live oak, Engelmann oak, sycamore, bigleaf maple, California bay laurel, white alder, olive, peach persimmon, goldenrain, mimosa, liquid amber and wisteria vine. Why is this important to growers in San Diego, Riverside, Ventura and Santa Barbara counties? Because growers in San Diego County (and probably other coastal counties) are being offered free shipping by the waste disposal companies of wood chips and free spreading of the mulch in their groves. What a deal!! But wait a minute! The problem lies in that the material I have seen is either not composted or poorly composted, because it heats up in the grove after delivery and starts steaming. This means that freshly shredded or chipped trees could very likely be spreading the borers right into their groves! 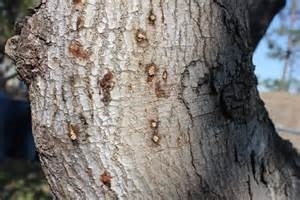 Growers should ask themselves “why are these trees in Los Angeles being cut down in the first place?” Trees are being pruned and cut down for a variety of reasons, but now that we have a new pest for which there is no control, we have to be very cautious about what we bring into our groves. Other problems that could be brought into groves include Phytophthora root rot and trunk cankers, oak root fungus, Dothierella cankers, and Asian citrus psyllid. Growers should insist that only correctly composted mulch be brought into their groves. During the composting process the piles should be turned at least five times to allow the material on the outside of the pile to be turned into the middle for correct heating of the entire pile. San Diego County tree care and landscape professionals and land managers have a great opportunity coming up to learn about the latest research in the ecology and management of oak pests Feb. 6th at the Balboa Park Recital Hall. UCCE has teamed up with City of San Diego Parks and Recreation, County of San Diego Ag. Commissioner, and the US Forest Service to host a workshop to provide information about oaks and oak woodlands at risk, pests and diseases threatening oaks, pesticide use and firewood management, and a new reporting program. They will specifically address the Gold Spotted Oak Borer and the Polyphagous Shot Hole Borer. For more information, and to register, view the flyer, or visit www.gsob.org, or contact Jan Gonzales.